Made Marion is so much more than just a craft store. Yes, we have a huge range of products that you can buy in our store, or from our online store. Yes, we have in shop expertise to help you choose the best product for your needs. Yes, we have some of the best prices in town. It is so much more because we know how important creativity is to human beings. Hey, without it, how would we have ever learned to make a shelter, or clothing, or fire, or cars? Creativity is crazy important to us all. And in the 21st Century we don’t get to use it on those basic needs so much, but it is still there, every day, looking for an outlet. We see engineers who make incredible 3D birthday cakes, CEOs who love to cross stitch, lawyers who make lampshades, general managers who knit. It really is one of the great universals we have in common with one another. In the 21st century, where so much is available online, a bricks and mortar shop provides a place to go, a place to be. Whether you are rushing in or staying for a while, we hope you enjoy coming into our shop. Or into our online shop! Best wish’s for your new venture and adventure. I love retailing, never the same day twice and always something new and exciting! Hope to see lots more of you. WooHoo – Fantastic to see a new creative craft space in Wellington. All the very best of luck to you. I will be in to visit very soon! Congrats – funny, I shopped at Goldings on about Dec 22, 2011 for bits for Christmas gifts and contemplated doing exactly what you have done. Love your name ! Do you still stock block/solid glycerin ? for soapmaking ? I would just like to say how lovely it was to speak with you when I visited your fabulous shop on Tory Street on the 28th of June last while on holidays in NZ. It was such a delight to walk around – loved the tour and your explanations about NZ yarn, along with showing me the beautiful NZ fabric range. And your shirt was an amazing array of coloured skyscrapers – the same fabric as a wall hanging was just striking. 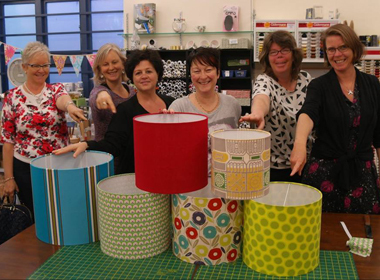 Thoroughly enjoyed listening to you speak on the topic of lampshade making – my first time coming across the craft – sounded so exciting that I would have signed up for a class had I been in Wellington a bit longer! Plan now to source a class back home over the coming months. You mentioned that you were only in the business five years, but you certainly have created a most welcoming establishment with your own unique style of shop layout – adorable. So, thank you for a most enlightening evening – I think it was just as well I was constrained by what I can carry in my luggage on my flight home or else I would certainly have bought quite a bit more fabric and yarn. Wishing you many, many years of continued success.